A heat register in a ceiling. Many heating, ventilation and air conditioning (HVAC) systems are made up of duct work that runs between the furnace and the individual rooms of a house. Heat registers are grates that cover the hole in the wall or floor where the duct enters the room. 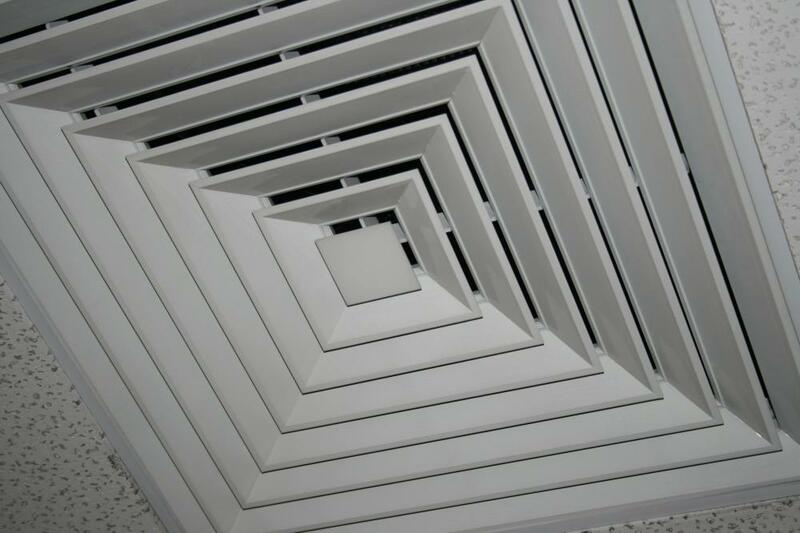 Louvres, or dampers, are often attached to the back of a heat register. These adjustable slats can open or close the register grill in order to customize the air flow. Heat registers can be both a functional and decorative part of any room, and come in many different materials including brass, cast iron, and wood. A forced air heating and air conditioning system utilizes the furnace to send heated or cooled air through the ducts and into the home. A fan pushes the air into duct work that runs through the walls and under the floors and ceilings, carrying it throughout the house. Heat registers at the end of the ducts serve a dual purpose: to cover and protect the duct from dropped items, and to adjust the airflow with the louvres or dampers. Heat registers are known by several names including air vents, vent covers, and air registers. Heat registers come in a variety of sizes, shapes, and types. Duct work can enter a room on the floor, the wall, or in the baseboards. These different entry points naturally require different types of vents. Air registers on the wall are commonly screwed or nailed into place, and those on the floor simply utilize gravity to keep them over the vent. Wall and floor vents tend to be flat and flush with the mounted area, while baseboard heat registers are usually a triangle shape with the grill on the front. The design of a heat register can vary from very plain and simple to ornate and intricate. Some of the most delicate designs can be found in Victorian style homes, where the heat registers can mimic the scrolls, swirls, and patterns of a stained glass window. On the opposite end of the spectrum, plain, inexpensive grates are available with an ordinary line or grid pattern. Custom made vent covers are available for individuals who cannot find a mass-produced heat register that fits their needs. In order for a heat register to work properly, care must be taken to ensure it has plenty of space. An air register should not be blocked by furniture or drapes. 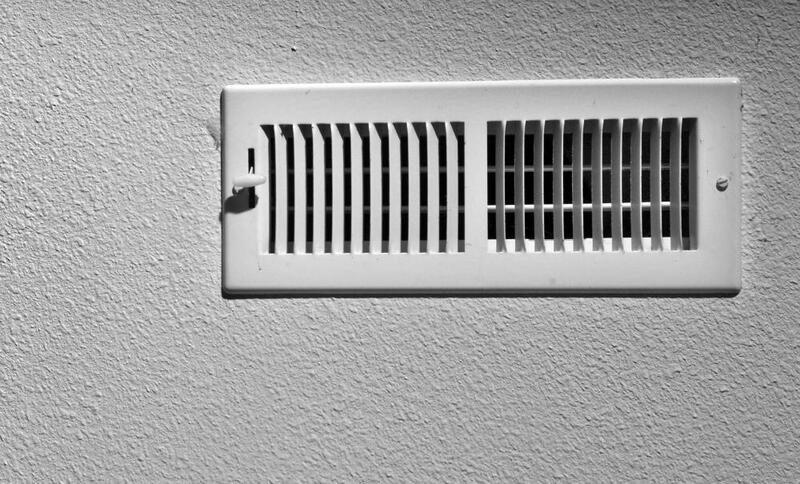 Dust or dirt can accumulate on the vent and impede the flow of air. For this reason, routine maintenance of the heat registers, including necessary dusting or vacuuming, should be a part of the regular housekeeping schedule. What is a Vent Diffuser? What is an Air Register? @Feryll - Look for other old houses in your area that were built around the same time as yours. Find one that is being remodeled or one that is abandoned, and see whether you can snag the old decorative heat registers. @Feryll - You can find almost anything at a good flee market. You might be surprised at some of the old items you find that you thought you would never see again. You might be able to find some vendor with old heat registers similar to the ones you have in your house. If you can't find the exact ones then you might be able to find a full set of another style that your girlfriend would like. Basic heat registers or vent covers aren't really designed to be repaired. When something goes wrong with one you are better off to go buy a new one to replace it. You can get them at most home improvement stores and at hardware stores. They aren't overly expensive, but they come in different types, so the prices vary. I have always called them vent covers. Whatever you call them, we have some really old ones in our house, and my girlfriend absolutely loves the way they look. There is some type of leafy design on the front of them. As I said, our heat registers are old and I wanted to replace them because on some of them the face is separating from the back part that closes. And some of the others are hard to open and close, and the fin like things fall out sometimes. My plan was to go to the store and buy new ones that are made better, but my girlfriend wants to keep the old ones, Is there a way to restore them? Fixing them looks like a difficult task because they are flimsy on the back side.